Blast of Tempest started out as a very serious action/drama about saving the world from an evil clan of mages while trying to avoid letting your friend know you were dating the sister whose death he’s on a quest to avenge. It only got more deliciously complicated from there. Then people spent a (really quite spectacular) 5 episodes standing around a barrel arguing about time paradoxes while making faces like that one. It turned out that that clan of mages wasn’t so evil after all, and just had a civil disagreement on how best to save the world. And then 2 billion people died. And now the show is a romantic comedy where people put on hero shows to sway public opinion. And the strangest part? At no point in that transition did it lose any of its smoothness or charm. Let me start over. Zetsuen no Tempest is an adaptation of a manga directed by Masahiro Ando, the guy behind Canaan and Sword of the Stranger, and scripted by Mari Okada, anime’s ultimate mixed bag (Fractale and Ano Hana both). It’s also a product of Studio Bones, though most people give that bit of information more weight than it’s actually worth (I see an article on the relative lack of meaning behind studio names in the near future). Ando’s work is fairly competent, though a bit pedestrian; action is flashy and compelling, scenes feel serious when they need to be serious, scene flow is on and off, and emotions in the second half are intentionally exaggerated with clever stuff like this gif of the month candidate. Mari Okada, on the other hand, has done a smashing job, something that becomes increasingly clear as the second half changes genres and becomes more entertaining rather than less. 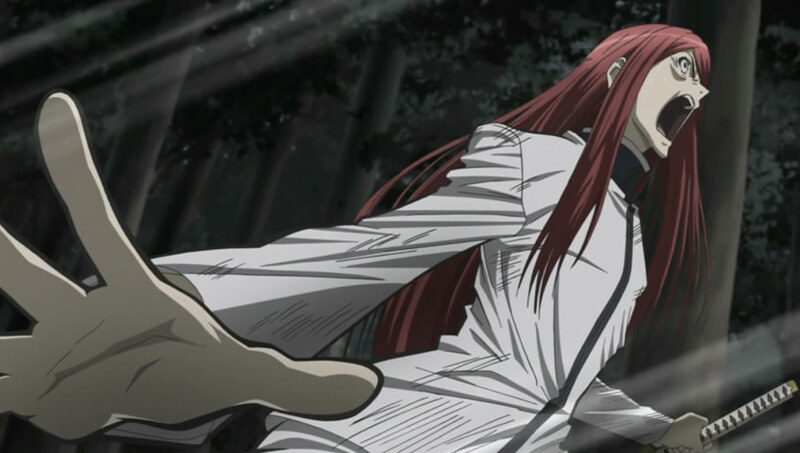 In many ways the romantic comedy elements of Blast of Tempest inversely mirror the elements of a series like Violinist of Hameln or Ghost Sweeper Mikami, where the connecting thread between a comedic beginning and a subsequent darker, more dramatic storyline is the characters built up in the first half. Though the situations Tempest’s characters may be in vary quite wildly, they remain multidimensional and fun to watch. This is the trait which allows the show to effortlessly make the transition between genres as many times as it does. More than anything, that points to the writing in this series deserving full marks. This entry was posted in Anime, Finished and tagged Anime, Blast of Tempest, Mari Okada, Masahiro Ando, Playing Catchup, POSES, Some Thoughts, Studio Names Really Aren't That Important by torisunanohokori. Bookmark the permalink.